Sir Peter Misfit jets in just in time to take the reins prior to the Sealed Bids Auction on 30 May 07 for 100 thousand pounds of U3O8. Having made a number of brave attempts to secure some uranium at recent auctions and failed to beat the competition the heat is well and truly on. The arrival of Sir Peter could be just the tonic as long as he gets plenty of gin. Apparently his reputation precedes him although nothing was ever proved. The board are aware that there is a demand in the market place for one million pounds of uranium and this auction represents only 1/10th of that requirement so once again the competition could be fierce. Sir Peter makes the point that on the other side of the equation the price has gone up dramatically to $122/lb and should deter a few bidders until the price has corrected too much lower levels that this. This view is met with mixed emotions; on one hand they do not want to fail again, on the other hand they do not want to pay top dollar. The young Buck with a myriad of charts and future projections has grown in stature as his previous attempts to persuade the Board to submit higher bids no longer look as immature as they might of appeared at the time. He points out that the Futures Market was still in its infancy and due to the lack of volume on this market it just could not be relied on to satisfy their needs. In conclusion he adds that the possible range of bids could vary from the current spot price of $122/lb to $135/lb. The weaker members of the Board are pleased that Sir Peter has arrived, as it is now his job to make the decisions and his neck that will be on the block. Sir Peter pours himself another large glass of Dutch courage to give him the strength he requires to come to a conclusion. Smart this knight of the realm, he also knows that he is in the hot seat and after all it is not his money. So he plumbs for the top end of the scale and Gigantum will go all out with a bid of $135/lb, which should do it! 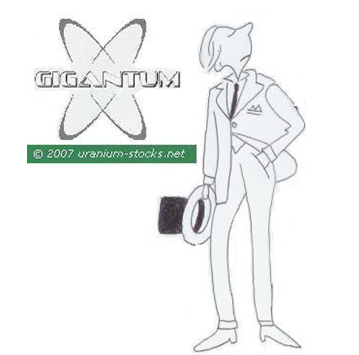 Back at Uranium Stocks we take time out to contemplate and role-play this situation. All seems reasonable and sensible and this slow moving utility companies chances of winning this auction looks good. However we are uneasy as this is no ordinary market, it is extremely small and the demand that we know about is overwhelming the supply. The demand that we do not know about lurks in the shadows like an assassin awaiting his prey. The hard-nosed wheelers and dealers in New York have taken an interest and want a piece of this the hottest play in town. They know that they must edge out the like of the utilities and also other private investors and fund managers. So they raise the bar to $137.5/lb. The winner of this auction must now go even higher so our prediction is that the result of this auction will be a mind boggling $140/lb. My word! Just think of all those NAVs to be recalculated!